SDMI dba Caribbean GeoTextiles offers environmentally friendly GeoTextile tubes and bags that are cost effective and easy to install either above or below the water's surface. 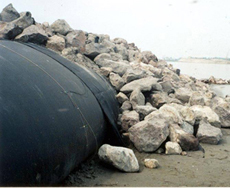 These geotextile tubes and bags are called soft structures made of porous woven fabric, versus hard structures like rocks and armour accropodes found many times in breakwaters. These tubes and bags offer environmentally friendly and cause minimal environmental impact, at a surprisingly affordable price, especially as compared to older methods such as hard structures. 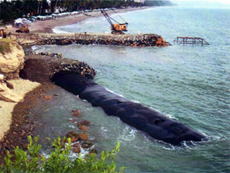 Contractors can fill the GeoTextile Tubes right in place in the water, working at a depth of up to 15 feet, or fill them right on dry land at the project site in locations such as Trinidad and Tobago, Martinique, Turks and Caicos, Puerto Rico, Belize, Honduras. SDMI dba Caribbean GeoTextiles environmentally friendly tubes and Bags are UV resistant, sand colored geotextile bags or tubes. They can be filled hydraulically or mechanically with sand, silt, sludge or spoils. They are often used instead of stone, concrete or other hardened systems for protecting the shoreline. Tubes and Bags are especially effective where there is a limited supply of hard structures like stone, especially when the cost of importing the stone or hard structure components make it cost prohibitive. Many people also feel the sand colored tubes are less intrusive and maintain the beauty of the existing environment. Caribbean GeoTextiles tubes, bags and turbidity curtains can be used to create or strengthen existing coastal structures. The non-intrusive sand-colored tubes and bags can be hydraulically filled with on-site sand or dredging spoils, which has to be disposed of any way. They are often also employed underwater or along coastlines to help prevent erosion or as a core for dune construction. Our GeoTextile Tubes and Bags are made of high-strength woven, porous, UV resistant fabric that is less prone to damage from storms, wave action and vandalism. Also, because Caribbean GeoTextile Products' environmental products are what is known as “soft” armored structures (versus "hard" armored systems such as rock, concrete rubble or riprap, or block), local construction permits are usually easier to obtain.